Bagan, the most famous tourist attraction in Myanmar is the home of more than 3000 pagodas and temples. 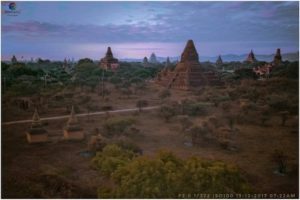 Bagan is famous for its amazingly gorgeous sunset and the image of sunsetting behind the plain of Bagan is mesmerizing. Here is our list of best places to view Sunset in Bagan. The breathtaking sunset view is completed with the truly amazing pagodas, shiny river, grayish mountains, and bloody sky. Finding a great-spot to get the perfect-picture of sunset is not hard but you need to know where to go. Many visitors and tourists choose to climb up the temples to see the sunset but this can harm the ancient temples. And also visitors are not allowed to climb up some of the temples time by time. But we still need to have a place to enjoy Sunset. Here are our recommended spots for you to get the perfect shot at sunset in Bagan. 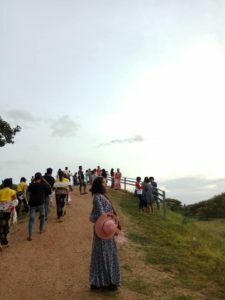 There are three manmade hills in Komauk, Nyaungletphet, and Sulamani. The three manmade hills are located close to Sulamani temple and Anauk Phwarsaw Village. To get to this area, here is the google location for Sulamani Temple. Those manmade hills are made to reduce the risk of damaging the pagodas from the sunset watchers. The manmade hills have 360-view of the Bagan plain and one of the best-places to watch both sunrise and sunset. The hills are quite high, so you can get a clear sight of sunset over the plain of Bagan. The manmade hills are quite crowded with visitors during the high travel season. 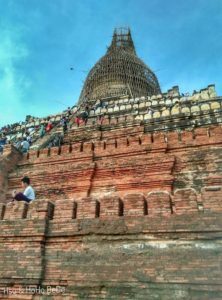 Shwe Gy Gyi temple is one of the few temples that people are allowed to climb up the pagoda. But, you are not allowed to climb till the top of the temple for your own safety. You can climb up to the balcony of the temple and watch the sunset. The balcony is already high enough to see the whole plain of Bagan and the sunset view is fascinating. The stairs up to the balcony is quite steep, so be very careful while going up and down. Here is the google location for Shwe Gu Gyi Temple. Shwe San Daw temple is also one of the few temples where visitors can climb up the pagoda and enjoy the sunset. But climb at your own risk. 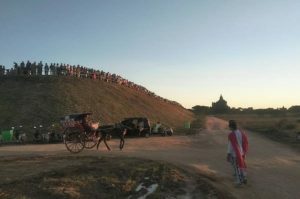 Bu Pagoda is another famous sunset-viewing-spot in Bagan and the pagoda is located on the bank of the Ayerwaddy river. The bell-shaped dome pagoda was damaged due to earthquake, and it broke into pieces and fell into the river. It was fully reconstructed after with modern materials. 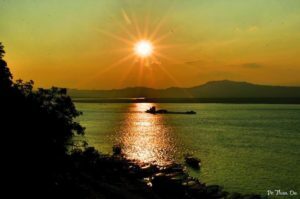 You can enjoy the sunset across the river and the incredible-view of sun going down behind the mountains from it. The golden Bu Pagoda shines so brightly during the sunset and it is amazingly beautiful. This place is near to the Alodawpyi Pagoda. So that you have to firstly find where is the Alodawpyi Pagoda. Here is the google map location of Alodawpyi Pagoda. It is located south of Alodawpyi Pagoda and it’s spacious gently sloping area. Even if you are late to arrive this place, you don’t need to worry about not having a space to enjoy a sunset. There is also tourist police at this area. Nan-Myint-Tower is located on the eastern part of the archeology site of Bagan and it is 13th story high tower. You can get the 360 view of Bagan plain and it is an amazing spot for both sunrise and sunset. There is a bar on top of the tower, so you can sip on your favorite drink and enjoy the sunset. The drink price are quite high though. The entrance fee is 5 USD per person. This restaurant offers great food and you can see the wonderful view of sunset. The atmosphere of this restaurant is quite and comfortable. You can view the sunset from the balcony of this restaurant. Since this restaurant is on the bank of Ayerwaddy river, you can enjoy the sunset through the shiny river. The following two places is a little bit far from Bagan, but you can reach by car within an hour. These two places are located top of the mountain, so that you can see the better view of sunset from these area. 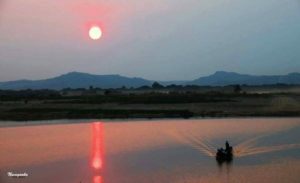 Tant Kyi Mountain is located on the other side of the Ayarwaddy river and you can reach there by car or by boat. Tuyin Mountain is located just outside the Bagan, on the way to Pupa Mountain. We will keep update on this list when we get more information about this topic. Enjoying sunset in Bagan is not the only thing you can do. There are many other things to do in Bagan. 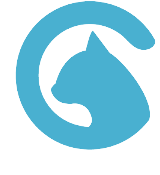 We would like to recommend you to read this article. Things to do in Bagan.